Abstract: The button-shaped extrafloral nectaries (EFNs) located on the bracts, bracteoles, calyces and leaves of cultivated sponge gourd plant, Luffa cylindrica, were visited by insects belonging to five different orders: Hemiptera, Diptera, Coleoptera, Hymenoptera, and Lepidoptera. Insects with biological-control potential recorded at the EFNs included ants, wasps and ladybird beetles. 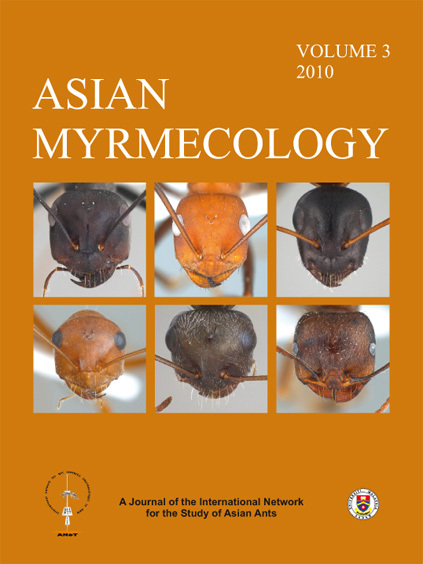 Ants, comprising ten species, constituted by far the most abundant group (84.44 ± 4.34 % of individuals) at the EFNs. Insect pollinators included honey bees, butterflies and wasps, which, while visiting the floral nectaries (FNs), also visited the EFNs. Ants were found in large numbers on EFN-bearing plant parts, particularly leaves and calyces. Aggressive and abundant ant species visiting the plants included Camponotus compressus, C. paria and Pheidole sp. The major insect herbivore was the red pumpkin beetle, Raphidopalpa foveicollis Lucas, which fed predominantly on the corolla of the plants and, to a lesser extent, on each of the EFN-bearing vegetative parts. The low abundance of herbivores on vegetative parts indicates that the ants and, to a lesser extent, wasps, bees and ladybirds visiting the EFN-bearing plant structures may be aiding in crop plant protection from the herbivores. Thus, though the EFNs of sponge gourd plants attract predators, pollinators and also extrafloral nectar thieves such as flies, ants are the major group involved in the facultative association with the annual crop plant. Such studies may aid an environmentally-friendly management approach involving the natural enemies of insect pests of EFN-bearing annual crop plants.